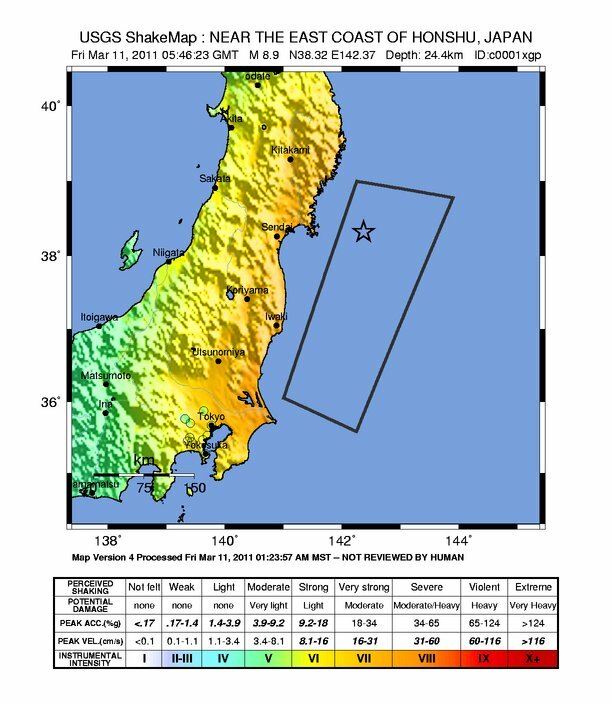 An earthquake with a magnitude of Mw9.0 has occured 130 km east of Honshu, Japan in a depth of ~25 km. This had been the fourth or fifth strongest earthquake to be recorded by instrumental seismology. The quake caused significant destruction to the Honshu Island and triggered a tsunami that destroyed a number of harbours. 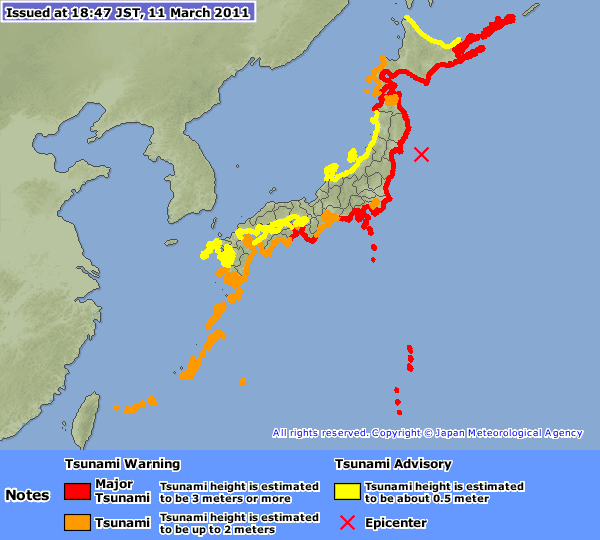 In some places (Sendai), tsunami heights were reported to exceed 10 m. A tsunami warning has been released for wide parts of the Pacific, but in Hawaii only 1 m was observed, therefore the warnings for the US West Coast have been lowered. The tsunami warning has now been cancelled. The waves were observed all around the Pacific with wave heights of around 1 – 1.4 m in Hawaii and similar numbers at the US West Coast. Crescent City, however, was hit by a 2.4 m wave. Some damages have been reported, and one person is missing. 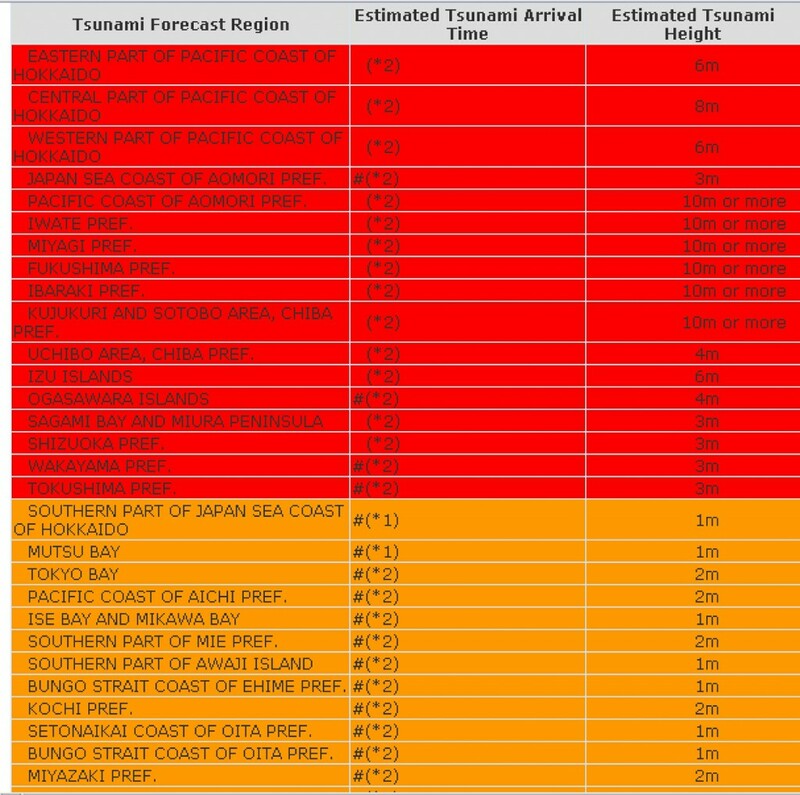 Most of the Pacific Islands did not suffer waves higher that 1 m.
Honshu Island suffered peak ground accelerations of up to 0.25 g and intensities in the order of VIII (instrumental intensity). Aerial images show devastated land and a huge tsunami wave hitting the coast. Rockfalls and landslides have been caused according to Al-Jazeera and Boston imagery and ground cracks occured widely. Liquefaction appeared as well as slope failure and differential ground settling. 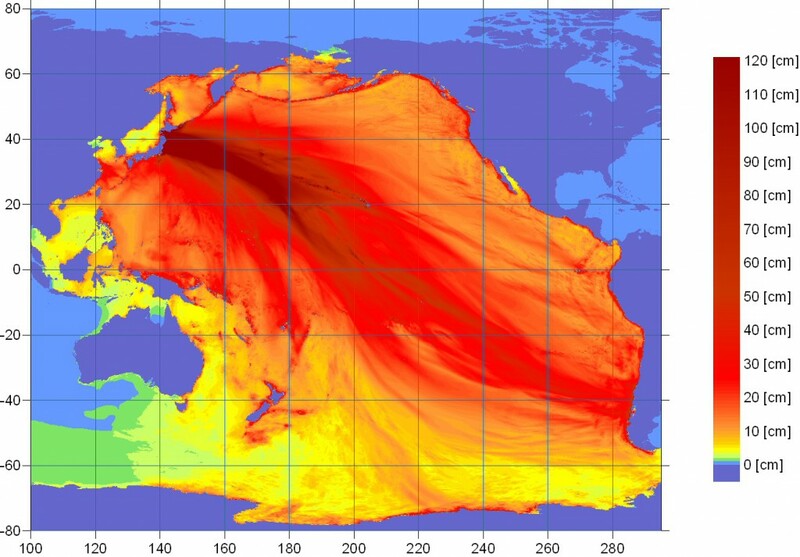 Nuclear power plants have been shut down and three meltdowns were reported after four explosions in Fukushima. An Oil refinery was under fire and fires were reported from all over northern Honshu as well as from Tokyo. A good video collection can be found here. The best pictures are as always to be found at Boston.com. Until now no final information on victims has been confirmed. Japan officials report about 3000 dead and 20000 missing. Yet it’s clear that damages will sum up to hundreds of billions of dollars, causing significant irritation on global stock markets. On 9 March a series of pre-shocks began with an Mw7.2 event only 40 km away from the location of the Mw9.0 event. More events with magnitudes up to M6 followed, three of them at the same day. Most scientists thought that the 7.2 EQ had been the main event followed by aftershocks, but obviously the highest amount of stress has not been released. The Collm seismological observatory of Leipzig University provides live access to their seismograms. Here’s the daily plot from 11 March. The observatory is part of the German Regional Seismological Network and located east of Leipzig. The Geophysical Institute of Leipzig University started instrumental seismology in 1902 and has a complete record since 1923! In 1935, the observatory moved from Leipzig to the Collm because of the increase of anthropogenic noise. There is a large number of paleoseismological studies from Japan (mainly in Japanese), among them Ishibashi & Satake, 1998, Rikitake, 1998, Okumura, 2001, Yamazaki et al., 2002, and Okamura et al., 2005. Barnes, 2010 deals with Archeoseismology in Japan, Ishibashi, 2004 provides an overview on historical seismology. Tsunami deposits are among others discussed by Nishimura & Miyaji, 1995, Nanayama et al., 2000, Minoura et al., 2001 (see below) and Goto et al., 2010. Ground truth trekking has a great article on that topic, too. I can really recommend to read it here. Satake, K.; Sawai, Y.; Shishikura, M.; Okamura, Y.; Namegaya, Y.; Yamaki, S.
earthquake (M~7.5) with 99% probability in the next 30 year. earthquake (M~~7.5) with 99% probability in the next 30 year. It is a huge tragedy, I hope everybody can survive in Japan. I know, it is a dream, but I want to believe. My english is not very well, excuse me. I have a quastion: is there a some correlation between Earth’s seismic activity and Earth’s position in an orbit at Solar system? You know, March, 21st – it’s a day of a spring equinox, in winter gravitational pressure Sun-Earth is most powerful, orbital speed on maximum. Can dynamical postion of Earth-Sun-Jupiter-Saturn create some preconditions for this situation? as far as I know, any attempt to prove a correlation between earthquakes and orbit/planet constellations failed. It is clear that there are additional forces depending on the positions of the moon and the other planets, but they seem not to be sufficient for increasing earthquake probability. 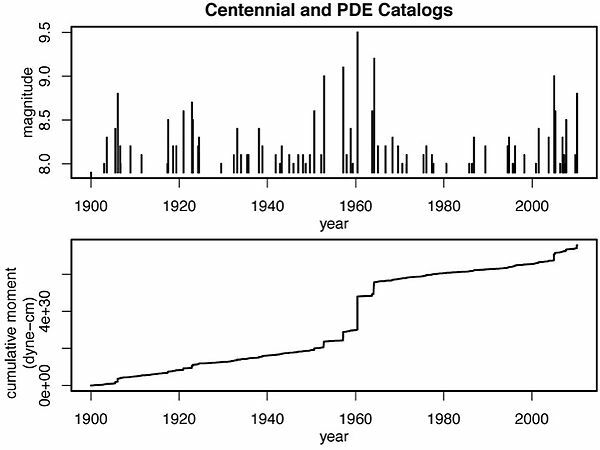 There are attempts to correlate EQs to heavy rainfall events and low pressure weather conditions, but the statistics behind that are quite difficult. Thank you for the answer, Mr. Grützner. Your work and researches are very important and interesting. I hope, the paleoseismicity can help mankind to predict similar accidents much more earlier than in few hours in the future. is there a direct connection to the recent EQ in New Zealand or do I have to dissociate one from the other? If there is a (tectonic) relationship, are more strong EQs somewhere along the Pacific continental plate expected in the near future? there should be no connection between the two earthquakes. They happened far away from each other and in a completely different geological setting. We know that earthquakes can trigger following events, but this requires them occuring at the same fault or at least within a certain system of faults. In my opinion the probability for large events somewhere around the Pacific plate did not increase. This is what statistics on historical data tell us and what we know from failure mechanisms. 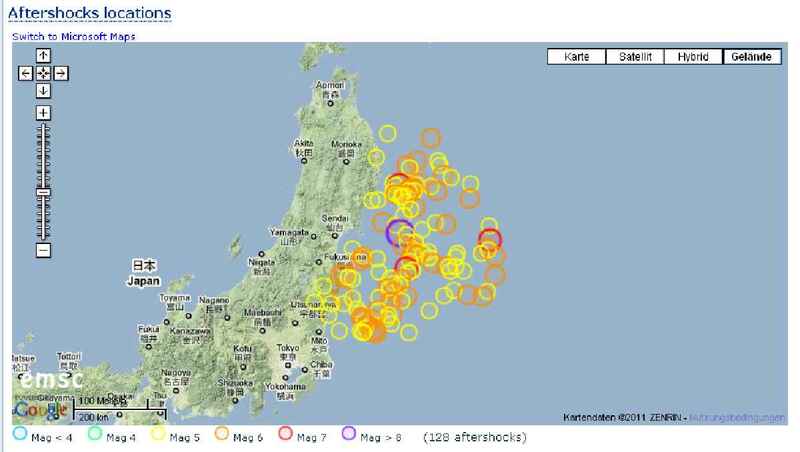 Of course there will be more strong aftershocks in Japan. Thank you very much for the prompt and informative answer! I hope you don’t mind me asking an other question. I have the impression, that there are more strong and devasting earthquakes around the world lately. E.g., on Christmas 2006 in Asia, last year in Haiti, now in Christchurch and Japan. 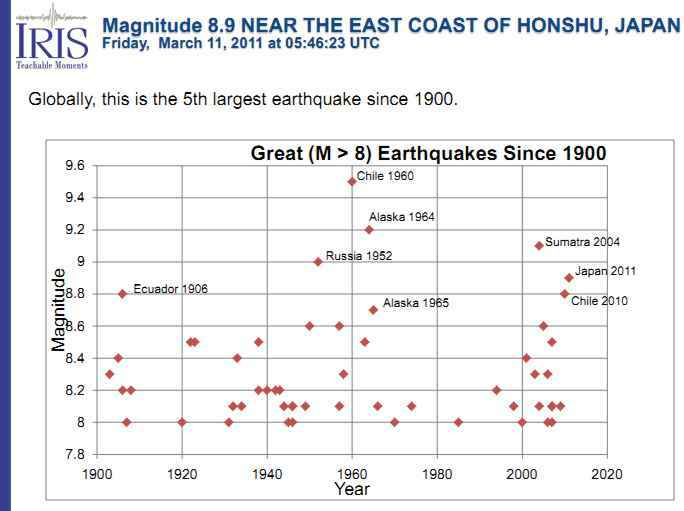 Not to forget the earthquakes in Chile or China and so on. 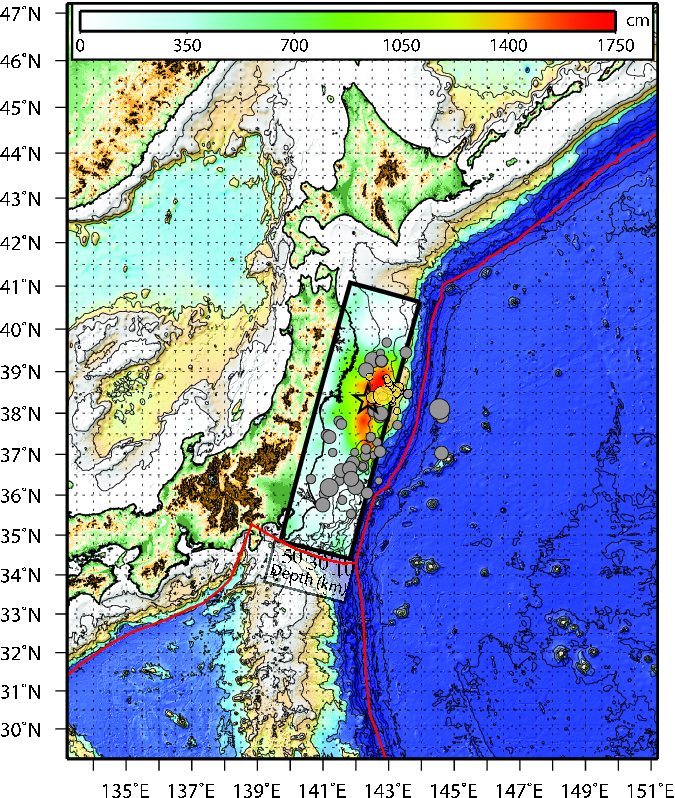 Is there more tectonic activity recorded than before? Or it is just more medial reporting on the events as more densely populated areas were/are concerned? Which – in the end – just gives the impression of an increase of earthquakes? I know you have said that there is no correlation with the salor system however After four years without any X-flares, the sun has produced two powerful blasts in less than one month: Feb. 15th and March 9th. This continues the recent trend of increasing solar activity associated with our sun’s regular 11-year cycle, and confirms that Solar Cycle 24 is indeed heating up, as solar experts have expected. Could this therefore have played a part? Could this be causing an increase on gravitaional “push” as oppossed to “pull”. Almost like a compresive force causing techtonic movement? to be honest, I do not know about the gravitation of a solar flare. I think we speak about a mass of some billions of tons. Sounds much, but isn’t compared to Earth (~6 x 10^24 kg), Moon (7 x 10^22 kg) and Sun (2 x 10^30 kg), so the gravitational effect will be low. There are stronger forces that affect the crust, like tides. In some places, body tides can be as high as 30 cm. They will for sure have a bigger effect. Even low pressure areas like hurricans will provide more additional force. I have never heard about a clear connection between solar activity and earthquakes. I just found your website, very informative. Nice job. I’ve been asked some of the same questions. For these very big events [I felt this one, I am in Sapporo, Japan; it lasted about 3 minutes shaking, like the earth was the ocean], the graph that IRIS has made can be a little misleading to the layperson, because the scale is logarithmic, and even an 8.2 added to an 8.8 still gives you an 8.8 — do you get what I mean? So if we plotted total energy, then there is REALLY a peak 1952-1964, then a big trough, and now another peak. We don’t have long enough records, though, to test the cyclicity statistically. Right now it seems pretty believable. Also, for these really big events, much and in many cases most of the damages and casualties are from the tsunami; if you watch videos of the tsunami approaching, you can see that most structures are still standing. Whereas shallow crustal earthquakes (like Haiti, Christchurch), when in populated areas, cause much more damaging shaking and destruction, even though they are MUCH smaller in terms of energy release. Thanks for adding that IRIS pie chart–very illuminating. Even if/when Chile 2010 and Japan 2011 are added, the picture will not change very much.